The Three R's certainly have changed since the days of the one room schoolhouse, chalkboard with erasers and dodge ball played at recess. And with the completion of the new Wando High School, the state of learning in the Lowcountry took another giant step forward. Located on the outskirts of Mount Pleasant along Highway 17 just past the East Cooper Airport, one of Charleston County School District's largest construction projects takes shape. "Work progressed right on schedule," reports Jack Burgess, senior project manager for Southern Management. "Our final completion date is June 2004." According to Wando principal Lucy Beckham, the staff and students are excited about the expanded space, and increased educational opportunities that are available in the new facility located on a beautiful campus. "Moving into the new building began right after the 2003/2004 school year ended, " states Beckham. "Wando's teachers and support staff appreciated having the summer to get acclimatized to the new facility." 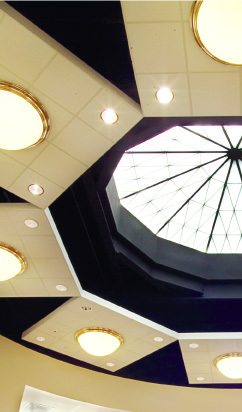 Built to serve 2,700 ninth through twelfth graders, Wando High School was designed to accommodate the rapidly growing East of the Cooper area. While it is impossible to accurately gauge the number of additional students the facility will need to accommodate in the future, the architect firm of LS3P Associates Ltd designed the building with wide corridors, spacious, multifunctional teaching stations, and sited the facility so that additional athletic and intramural facilities could be easily added. Architect Eric Aichele, AIA, principal in charge says, "It was a challenging project simply because of the size and because it is a comprehensive high school including fine arts, vocational education, along with all its high tech capabilities." Remember the days of typing and shorthand classes and the Future Farmers of America? Career opportunities have certainly changed since then. Wando High School offers its students insight into many different vocations such as pre-engineering, pre-med, culinary arts and health sciences. Beckham says, "This school is large enough to offer a quality education along with many diverse career choices." There are a total of seventeen science labs, a high tech culinary arts center complete with professional restaurant equipment including freezers, ranges, and a separate upscale dining area for students to learn table service. Named the "Wando Bistro," community clubs, local businesses and senior citizens groups will be able to reserve tables in the room for luncheons and coffees. With oak/cherry paneling, sophisticated black lighting fixtures, and a separate entrance and hostess stations, the Wando Bistro could easily rival some of Mount Pleasant's local eating establishments. Seven ponds, the majority manmade, surround the buildings for storm water control. Visually pleasing, these ponds were constructed with a tiered effect and blend seamlessly into the surrounding landscape. Again showcasing how everything was intricately placed, several of the ponds and neighboring grounds were designed for use in environmental science classes including wildlife biology and marine science. Planning for this crowning jewel started in 1998 through the use of a federal planning grant. During the planning phases, the concept of a 'school within a school' was decided upon. All Wando High freshmen will take their "core" classes , math, science and English, in one designed wing, while the remaining grades will have organized smaller schools all located within the larger or main campus. For students seeking to learn the basics of cooking and sewing instead of professional culinary skills, Wando High School also offers several home economics teaching stations. Each classroom is technology rich and comes complete with eight data drops and a 35 inch television monitor. 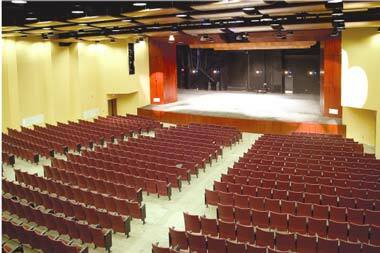 Partially funded with a $600,000 contribution from the town of Mount Pleasant, the 900-seat performing arts center is available to local community groups and organizations .A high-tech audio system has been installed along with acoustical wooden clouds suspended from the ceiling for maximum sound performance. There is a recessed orchestra pit, several dressing rooms, and a seperate scene room. "This building was designed from day one for public use, " notes Aichele. "After hours, the building can be zoned off allowing the general public access to only certain key areas." The competition gymnasium area, with seating for 2,750 can be divided into two separate spaces for dual events. The surrounding bleachers can be mechanically arranged depending on the type of event being held. Behind the bleachers and also in an adjoining room a marley flooring system has been installed along with balance bars and walls of studio mirrors. These are perfect for dance classes, acrobatics, and exercise classes. Sited on 110 acres, this impressive 433,121 square foot building boasts some amazing statistics. The grounds include a 4,800 square foot field house complete with a 1,598 square foot press box. Student parking spaces total 1,179, with 33 visitor spaces, 368 staff spaces and room for 20 buses. Inside the school, there is a 906 square foot performing arts center; the gym has over 2,560 square feet; and the specialized food court has 780 square feet. 2,780 tons of steel, 12,000 tons of concrete, over 800,000 bricks and concrete blocks and a total of 76 individual HVAC units were used in construction. The new Wando High School has two multi-purpose fields along with separate files for band practice, soccer, football, baseball and softball. There are also six tennis courts, a track area, and a shot putt and javelin area. There is also a separate wrestling room and a fitness and weight room. In addition to the standard athletic fields, the new Wando High School also has an eight lane rubberized completion track and a planned cross country path will wind through the 100 acre campus. The faculty and staff understands how confusing today's career choices and job market can be. That's why Wando High School has devoted an entire department to helping the leaders of tomorrow make wise career decisions. The Counseling Career Center is made up of guidance counselors and support staff ready to assist students in deciding their future. For many years Wando High School has been recognized for it's academic excellence. Finally there is a campus of the 21st century built specifically to carry out the future vision of Wando High School.